Learn MMA from Victory MMA owner, UFC Veteran, and 3 time Abu Dhabi World Champion Dean “The Boogieman” Lister, as well as numerous professional trainers of current and future UFC Fighters. We train beginners as well as seasoned professional cage fighters every day and night at Victory MMA. And there are no MMA contracts to sign at Victory. You “Pay As You Go,” and cancel your membership if you need to, with no cancelation fee. We guarantee the best MMA instruction in San Diego, a clean and professional gym, and the upmost in customer service, or your MONEY BACK! 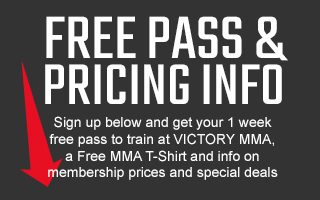 SIGN UP FOR A FREE WEEK OF MMA CLASSES AND A FREE MMA T-SHIRT! Our professional Coaches teach all aspects of the MMA game, with eight Jiu-Jitsu black belts instructing you on your ground game, Boxing and Muay Thai professionals instructing you on your striking skills, and seasoned MMA Coaches and Fighters instructing you on how to incorporate it all into your MMA skill set. And if you want to bring those MMA skills into the cage, we are “State Sanctioned Promoters” of MMA Fights, and can assist you with choosing the right event and the right opponent. Join for as little as $99.00 a month, or less depending on current sales and qualifying military or other discounts, and enjoy more than just the best MMA Training. Your membership also includes Boxing classes, Kickboxing classes, CrossFit classes, and Yoga classes, as well as unlimited “Guest Pass Privileges,” eight private showers, sauna, acupuncture and massage services, a large lounge to socialize and prepare for your classes, and team building social events.